TOKYO, Jul, 23 2018 - (JCN Newswire) - Fujitsu Limited and NPO SEEDS Asia(1) will conduct a field trial in India that utilizes a smartphone application, including augmented reality (AR) technology(2), to counter flooding and to raise citizens' disaster awareness. The field trial seeks to measure flood water levels and to map out and visualize conditions of urban flooding. The trial will be conducted in India's Varanasi, an urban area prone to flooding damage, between July and September 2018 when localized and torrential rains are frequent. In India, flood damage in cities due to sudden rain storms has become increasingly serious, demanding measures to accurately grasp the state of urban flooding and quickly deliver evacuation instructions. This field trial will use a smartphone app and the support of the staff and students of seven local schools(3) , students from Banaras Hindu University, Varanasi city residents from whom the District Disaster Management Authority(4) has gained cooperation, and others, to measure the water level at 12 locations(5) at regular intervals when it is raining. Furthermore, in addition to immediately displaying the measurement data on a map so that evacuation instructions can be quickly issued to residents, the system will be evaluated for its effectiveness in collecting disaster prevention information that can be used as a map indicating flooding danger zones. To improve India's flood countermeasures and raise citizens' disaster prevention awareness by collecting and visualizing information useful in disaster prevention. 1. Fujitsu: Management of the field trial, development of the application, construction of the system, and visualization of measurement data. 2. SEEDS Asia: Support for flood water level measurement using smartphones by high school staff and students, among others. 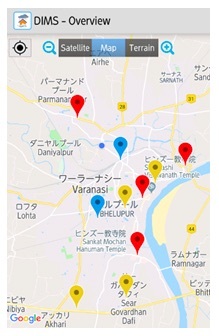 The staff and students of seven local schools, employees of Varanasi's District Disaster Management Authority, and Banaras Hindu University students will use smartphones to measure water levels at 12 locations within Varanasi at regular intervals when it rains, using one of the following three methods depending on measurement location. A. Visually check the water level against the tires of cars parked on streets, select one of three preset options based on the water level, and upload the data along with a picture, information on the location where the picture was taken, as well as comments. 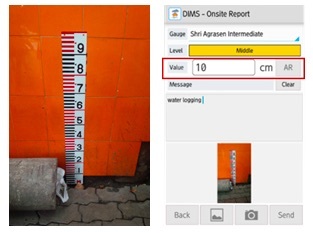 B. Visually check the water level against scales installed at schools, input the value shown on smartphones, and upload the data along with a picture. 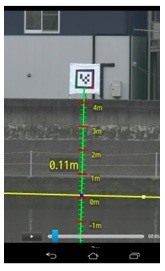 C. Use AR markers installed on locations such as school fences to overlay a scale onto the camera image on the smartphone, and digitize the water level by tapping on the surface of the water in the camera display, then upload the data along with a picture. The system will display measurement results and three damage levels on a map. The trial will evaluate the effectiveness of the map visualizing the measurement data and the state of flooding in the city as a hazard map, for use in tasks such as issuing evacuation instructions to residents. (1) SEEDS Asia A non-profit organization working on reducing disaster risks and environmental problems in Asia. This NPO is headed by Professor Rajib Shaw of the Graduate School of Media and Governance at Keio University in Kobe Japan. (2) AR technology Augmented Reality (AR) technology expands and enhances human senses by overlaying digital information obtained utilizing ICT onto information gained from human senses (reality). (5) 12 locations Seven local schools mentioned above as well as Kashi Railway Station, Raja Bazar Road, Girja Ghar Crossing, and two locations in Banaras Hindu University.